Gallia Prosecutor Jason Holdren, upper left, discusses the addition of a new victim’s advocate during a meeting with the Gallia Commissioners Thursday. Director of Victim Services Regina Brown sits at his right. Commissioner Harold Montgomery, upper right, sits next to Commissioner Brent Saunders, lower right. Commissioner David Smith not pictured. 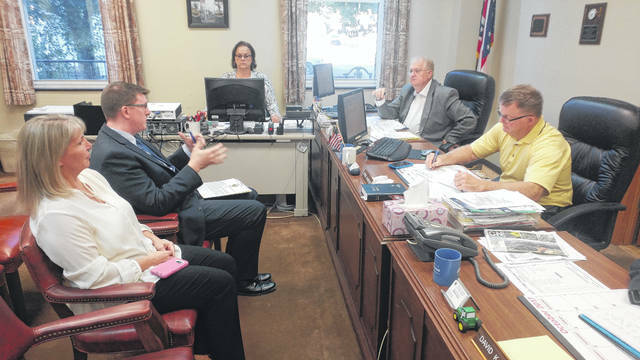 GALLIPOLIS — Gallia Prosecutor Jason Holdren announced Thursday during a Gallia County Commissioner meeting that a recent grant approval for a second full-time victim’s advocate would be joining his office. The position is fully funded by federal money and will be at no cost to Gallia budgets. Historically, the office has employed one advocate to cover all types of crime. “I would like to thank Regina Brown, the director of victim services, for her service to our community,” said Holdren. The Gallia County Prosecutor’s Office Victim Assistance Program carries out man essential functions in the local criminal justice system, such as: informing victim’s of their rights, keeping victims informed of court dates and events occurring in their cases, providing counseling referrals, assisting in completing victim impact statements for the court and the victims of crime applications, speaking for victims in court and safety planning. This new position will allow the office to expand services to victims in the juvenile court system. “Since taking office earlier this year, it has been my goal to obtain funding for an additional advocate for my office,” Holdren said. “We have handled a multitude of cases this year involving crimes of violence, property crimes, and crimes against children and it was clear to me that we needed an additional advocate to serve the need of these crime victims and families in Gallia County. Brown will continue to work with victims of felony crime, while the new advocate, Christy Perkins, will concentrate on serving victims of juvenile crime. Perkins has prior experience with juveniles while once having served as a teacher. According to Holdren, the grant is set for one year and the office would look to attempt to renew two grants to continue funding its victim’s advocate program. According to Holdren, surrounding counties typically have more advocates than Gallia, so this was a much needed role to be filled. “Every opportunity I have to bring federal dollars into Gallia County that won’t cost our people any money, I’m going to do that,” said Holdren.